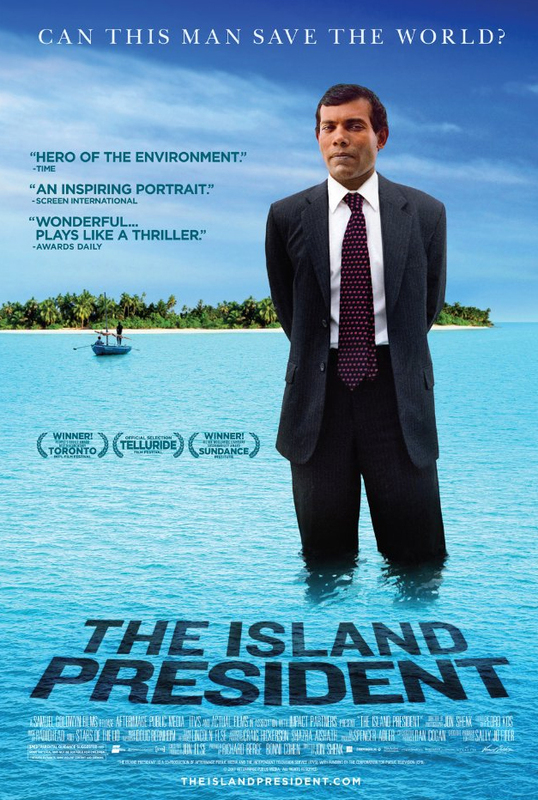 Is there a more depressing movie out these days than THE ISLAND PRESIDENT? Not likely. Not for anyone concerned with the earth and the increasingly hostile environment we're making of it. The encompassing depression likely to be experienced by viewers of the film who also keep up with international news will only grow as the movie goes on because -- unlike most documentaries that hit the screen -- events have caught up with the movie in ways expected (bad enough) and not (which prove even worse). Prior to his becoming President of the Maldives -- a set of islands in the Laccadive Sea, off the coasts of Sri Lanka and India -- Mohamed Nasheed (shown on above poster and below) was tortured and imprisoned by the ruling dictator of the Maldives, Maumoon Abdul Gayoom. 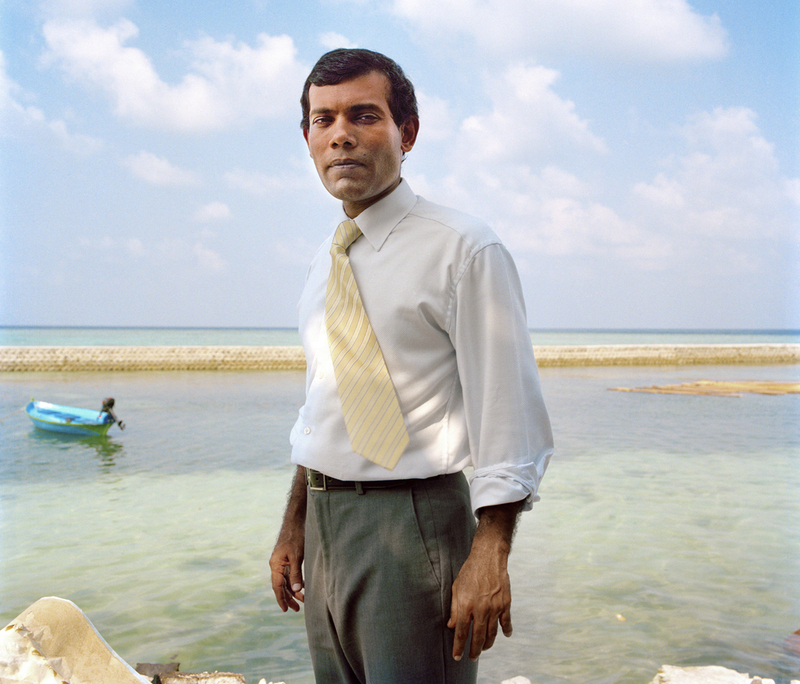 After a long and grueling process, Nasheed helped bring democracy to the Maldives and was elected its President, a post he held for a little over three years. Then, just this past February, in what looked like a bloodless coup (but with the threat of blood, should Nasheed not step down), Nasheed resigned and Gayoom's forces again took control of the islands. During his three-plus years in power, Nasheed devoted his career to calling attention to the fact that, with global warming -- sorry fundamentalists: it must be god, right? -- raising the sea level, the Madives will eventually, and sooner than later, be covered by the ocean around them. It would appear that, unless huge changes to the environment are made by the world's largest and/or most populated countries, the Maldives are scheduled for extinction. So Nasheed took his cause to the world stage, especially to the 2009 Copenhagen Climate Summit -- at which he more or less "starred." During all this he was concurrently filmed by documentarian Jon Shenk (shown below and co-director on Lost Boys of Sudan) in what is said to be the most time any President of any country has allotted to a filmmaker. 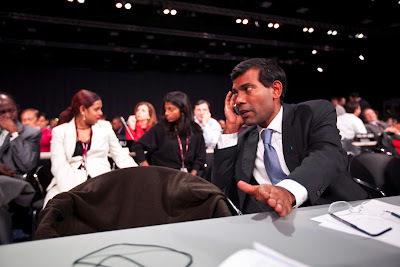 But Nasheed is nothing if not smart and PR-oriented. He knew that his little country could only profit from any notice of its plight that he -- and Shenk -- could bring it. And so off the Prez and his filmmaker go, on a kind of whirlwind tour of his country, to New York and the U.N., and to Copenhagen and the Climate Conference. The U.N. proves useless, as usual, and even at the time, that Climate Conference was said to have achieved next to nothing (events since have proved that assessment on the mark: carbon dioxide levels in the atmosphere continue to rise). Under the best of circumstances, what hope is there for the Maldives? And now that Nasheed has been deposed, there is even less. As I say, all this is beyond depressing. Worse, the movie itself is not all that well-made or worthwhile (unless I am allowing recent events to unduly color my feelings about the film). 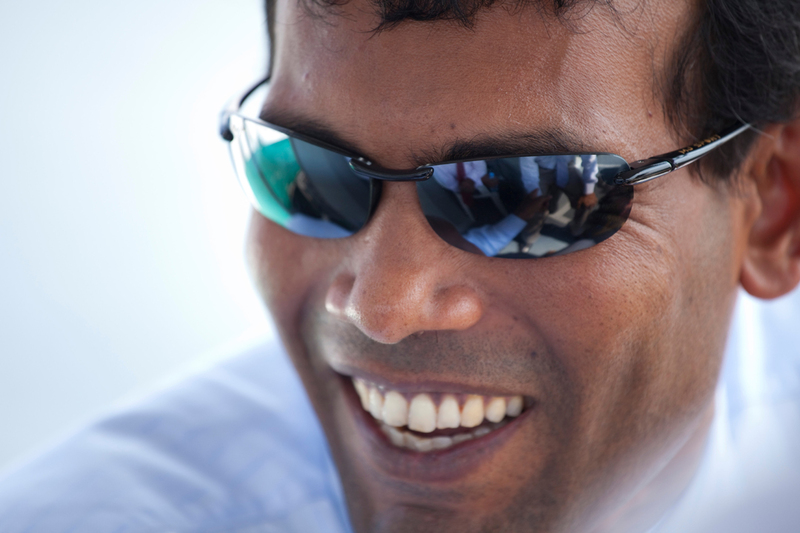 Yes, Nasheed radiates a positive force and it's fun to watch him work the room, even as it seems apparent that he is unable to accomplish much, other than keeping the spotlight on him and his country. Toward the finale, we see sandbags being placed around the edges of the land, and Nasheed remarks something to the effect that all the nation's resources and money will need to go for this sort of thing, rather than for education and other public services. But if the islands are going to be lost to the water, what good are sandbags? And if these will work, then for how long? The movie, by concentrating so heavily on the Prez and his personality, is missing a lot of factual information that we might like to know. The Island President's winning of the People's Choice Award at last year's TIFF had more to do with the feel-good aspects of the film: Nasheed's personality and our need to believe that hope remains and help is on the way. Given what has happened since that win, I doubt it would now merit a showing, let alone a prize. Together, the film and current events do raise an interesting question: What should we do at this point? Continue to agitate for climate control? Or first start working for the return of Nasheed to his rightful office as the island President, so that he -- and we -- can then continue to work toward a goal about which the people who control our world clearly do not care. The movie, 101 minutes, from Samuel Goldwyn Films, opened this past Wednesday, March 28, here in New York City at Film Forum. (There will be a Q&A with filmmaker Jon Shenk at both the 7:50 shows on Friday, March 30 and Saturday, March 31.) The film plays tomorrow, March 30, at the Cleveland International Film Festival, and also opens tomorrow in San Francisco at Landmark's Embarcadero Center Cinema. You can view other dates, cities and theaters by clicking here.